Home » Gadaa » What is Oromo’s Gada system? The Oromo Nation is the community concerned with the Gada system. The Gada System has been practiced for centuries and remains functional into the present among all of the major clans such as Borana, Guji, Gabra, Karrayu, Arsi, Afran Qallo, Ituu, Humbana, Tulama and Macha Clans of the Oromo Nation. Major Oromo clans have established the centres of their Gada at several places based on their territorial settlement. The Borana and the Gabra Oromo established their Gada centres at Gumi Gayo and Arero in Borana Zone, the Guji at Me’e Bokko and Nura in Guji Zone, the Tulama at Oda Nabe and the Karrayu at Hora Sama in East Shoa Zone, the Macha at Oda Bisil and Oda Buluk in West Shoa and East Wellega respectively, the Arsi at Oda Roba in Bale Zone, the Ituu and Humbana at Oda Bultum in West Hararghe. 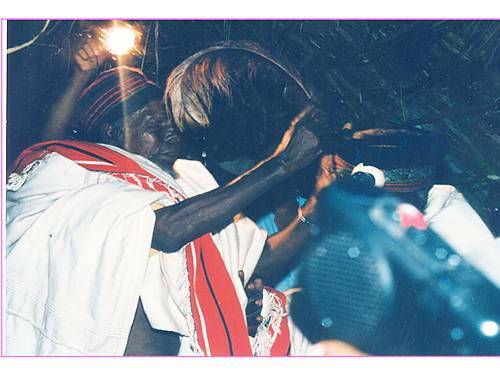 Gada assemblies, power transfer ceremonies and transition rites took place at these cultural spaces under Oda (sycamore tree) which is regarded as the symbol of the Gada System. Besides these main centres, there are also several ritual and ceremonial places within each clan’s Gada system. These cultural spaces are legally and culturally protected. The Oromo are known for their remarkable indigenous democratic socio-political system known as the Gada which they have kept working for the last five centuries. As a governance System, Gada guides the life course of individuals and regulates political, economic, social and religious activities of the community. It also serves as a mechanism of socialization, education, religious expression, peace maintenance and social cohesion and promotes the principles of equality and freedom. Under the Gada System, Oromo society is organized into five Gada generation classes or sets which rotate every eight years to assume political, economic and ritual responsibilities. The recruitment to the membership of the five Gada classes is based not on age but rather on genealogical generation ‘descent’. The entire class progresses through eleven series grades. The system rotates every eight years to allow each class assume power in the middle of the life course (the sixth grade) called Gada (Luba). The class in power is headed by a political leader known as Abba-Gada literally “father of the period”. The transition is marked by a formal power transfer ceremony. Gada is a complex system that incorporates pivotal institutions such as moggaasa (naturalization), guddifacha (adoption), araara (conflict resolution), gumaa (reparation), rakoo (marriage law) waaqeffannaa (Oromo religion) and Siinqee (institution to safeguard women right). Within the System, there is a thanks-giving ceremony known as Irrecha nationally celebrated at Lake Arsadi. The Gada System has developed through the cumulative experiences gained from practices and lessons of many generations of Oromo Nation. Who are the bearers and practitioners of the Gada system? Are there any specific roles or categories of persons with special responsibilities? The Oromo recognized the Gada System as part of their cultural heritage and as a contemporary system of governance that functions in concert with the modern state system. The Gada System is an all-inclusive social system in which every member of the society has specified roles and duties during one’s life course. This begins when sons join the first grade as members of Gada class (generation class or set) forty years after their fathers and are initiated into the next higher grade every eight years. In the fourth grade, known as Kusa, the class forms its own internal officials (adula hayyus) and its own assembly (ya’a). Regarding persons with special responsibilities, the Abba Gada, the elected chair of the class leadership presides over the assembly. Together with the Gada class in power, he is responsible for the day-to-day administration of the community’s local affairs including dispute arbitration and maintenance of social order. His duties also include transferring knowledge and skills associated with the functions of the democratic Gada System to the members of succeeding grades. The retired Abba Gada and his council called Yuba serve as counsellors for the ruling Gada Class and are in charge of administration of justice. The Qaallu, the religious leader, leads the ritual ceremonies, such as blessing Gada officials and operations. As such, he plays an indispensable role in power transfer occasions and legitimizing the ruling Gada System. Women are consulted in making national decisions and ensuring that women’s rights are protected. How are the knowledge and skills related to the Gada system transmitted today? The knowledge and practices of the Gada System have been transmitted from generation to generation in various ways. At a household level, parents transmit orally knowledge about the ethics, practices and rituals of the system and socialize their children into Gada culture. Then, after sons join the Gada System and collectively as a class pass through the five grades (daballe, junior game, senior game, kussa, raba dori), the abbaa raagaa (oral historians) teach the sons argaa- dhageettii (eyewitness accounts and oral traditions) about history, laws, rituals, time reckoning, cosmology, myth, rules of conduct as well as the function and importance of the Gada System. On important occasions, members of the ruling Gada Councils and assemblies, active and retired, emphasize these themes and pass the knowledge through the words of mouth. In the meetings that take place every eight years to re-examine the existing laws, the seniors reiterate them in public and legislate new laws, demonstrate and share knowledge about the operation of the Gada System. The school curriculum in Oromiya is designed to ensure that the knowledge and skills associated with the element are transmitted to children in their tongue. Currently, the Oromiya Radio and Television broadcast programs in the Oromo language about various aspect of the Gada System to increase awareness. As a result, when the group enters the Gada Grade (Luba), they will have acquired all the necessary knowledge to handle the responsibility of administering the country and arranging and presiding at the celebration of rituals. What social functions and cultural meanings does the Gada system have today for its community? For the Oromo today, Gada constitutes a dynamic living culture that regulate contemporary Oromo political, social, economic and religious life. As a social institution, it functions as a mechanism of socialization, conflict resolution, judicial administration, religious expression and social harmony. Contemporary Oromo political culture, moral or ethical system and cultural traditions are shaped by the evolved traditions of Gada civilization. The Gada System distributes power across generations and down to community members, creates strong link between successive generations, and gives to the members of the community a sense of identity and continuity. Oromo philosophy, art and calendar are based on Gada as an expression of Oromo civilization. The public conduct of Individuals is governed by safuu (Oromo moral system). Gada functions as a system of cooperation, social integration, enforcement of moral conduct and principle of peaceful co-existence with other ethnic groups. Gada is an indigenous system of human development on the basis of which the Oromo welfare system is institutionalized, communal wealth distributed, rules of resource protection and environmental conservation enforced and through which all their aspirations are fulfilled. An Oromo cannot imagine functioning as a human being or living in a community apart from rules of behaviour preserved and protected in the Gada System. Even the governing agencies of the Oromiya Regional Government derive from the traditional institutions of the Gada System Gada egalitarian ethos and communal solidarity. The Oromiya Regional State named the regional parliament after the traditional Gada Assembly known as Chaffee. Is there any part of the Gada system that is not compatible with existing international human rights instruments or with the requirement of mutual respect among communities, groups and individuals, or with sustainable development? The Gada System does not contain any element that is incompatible with existing international human rights instruments. It is a democratic and egalitarian political system based on equal access to office in which only merit counts. In the Gada System, the supremacy of the law is paramount and the equality of all before the law is sacrosanct. Even the Abba Gada, head of the Gada executive branch, if accused of violating laws and regulations, could be impeached, tried and uprooted (buqisu) from office before official tenure and replaced by one of the members of his class. Supreme legislative authority belongs to the people’s Chaffee or Gumi (people’s assembly). Every citizen has the right to speak and be heard in the Assembly of multitudes. Decisions over the use of common resources and the settlement of disputes are reached after thorough discussions and deliberation. Gada System of checks and balances such as respecting eight years rule, power sharing and balanced opposition of parties helps avoid subordination, exploitation, corruption and misuse of power. The women’s siinqee institution within the System enables Oromo women to have control over resources and to form mechanisms of solidarity and sisterhood to deter men from infringing upon their rights and promote gender equality. Moreover, the Gada system contributes to sustainable development of the community as it engages every member in social and economic development duties and regulates conservation of the environment. Thus, an understanding of the System by different communities helps for inter-cultural dialogue and encourage mutual respect. The Gada system have been added to UNESCO as the Representative List of the Intangible Cultural Heritage of Humanity since Nov. 30, 2016. The article is extracted from the “Nomination file no. 01164 for inscription in 2016 on the Representative List of the Intangible Cultural Heritage of Humanity.” Presented at the Intergovernmental Committee for the Safeguarding Of the Intangible Cultural Heritage. Eleventh session, Addis-Ababa, Ethiopia, November 28 to December 2, 2016.